Using phrases from the popular book “Go Away! 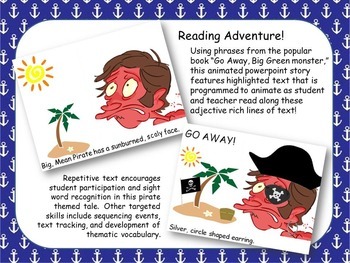 Big, Green Monster,” this animated powerpoint story features highlighted text that is programmed to animate as student and teacher read along these adjective rich lines of text! Provide all your students access to the text using this adapted reader! Repetitive text encourages student participation and sight word recognition in this pirate themed tale. Other targeted skills include sequencing events, text tracking, and development of thematic vocabulary. 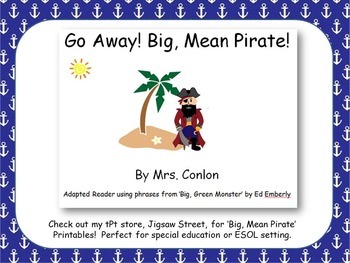 Check out my tPt store, Jigsaw Street, for printables to go along with 'Big, Mean Pirate.' Perfect for the special education or ESOL friendly learning environment.